Full of flavor, low in fat and calories with healthy ingredients, this is a terrific choice for the New Year. PREPARATION: Preheat broiler, combine first 7 ingredients, set aside. Arrange bread slices in an even layer on a baking sheet. Top each bread slice with 1 piece of cheese; broil 3 minutes or until cheese melts and bread is toasted. Remove pan from oven. 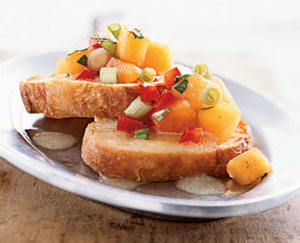 Top each bread slice with about 1 1/2 tablespoons salsa; serve immediately.